The country star gave the ready-to-party crowd reason to do just that at her Tacoma Dome concert Thursday night. Divorce isn’t easy, especially when tabloid hounds want to know all the click-mongering details. 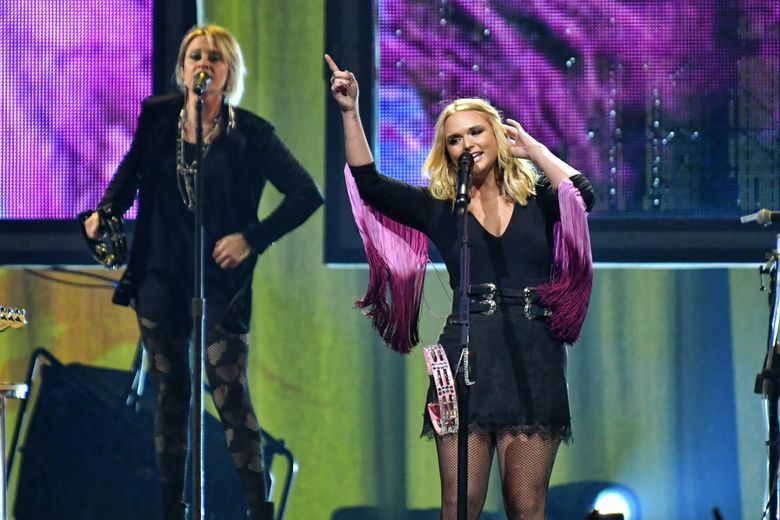 For her part, Miranda Lambert hasn’t done too much to feed the gossip machine since her 2015 high-profile split with fellow country star Blake Shelton. Instead, she grabbed her guitar and hit the studio to record her 2016 opus, “The Weight of These Wings” – a doozy of a double album that’s more than just a breakup record. There are tears in her beers, sure, but the 24-song set that won best album at last year’s Academy of Country Music Awards finds Lambert (who’s since picked up with new beau Anderson East) coming full circle, throwing on her “Pink Sunglasses,” rediscovering herself and moving on. When her Livin’ Like Hippies tour pulled into the Tacoma Dome on Thursday, Lambert seemed more interested in the beers than tears – or at least giving the ready-to-party crowd reasons to have a few. Club vets Turnpike Troubadours and rising radio-country star Jon Pardi kick-started the night, the latter eliciting near boy-band level of shrieks from eager fans (a pink brassiere eventually found its way on stage). The clean-cut singer has come up with an impressive number of ways to essentially say that ladies make him feel good (one particular lass turned his “knob right to 11”). But if you can gut the platitude onslaught, Pardi and his ace band put on great show, sliding through Southern rock boot-stompers and pop-country sing-alongs. Pardi just might be headlining the next time he’s back in Tacoma. After her eight-piece backing band filed on stage, Lambert joined them in a rollicking cover of John Prine’s “That’s the Way the World Goes Round,” followed by a fiery version of “Kerosene” – the breakup title track from her 2005 debut that ends in flames. The jangly ’60s psychedelic-hued lead riff fit the faint Summer of Love aesthetic of her Livin’ Like Hippies tour, the name of which stems from a line in her song “Highway Vagabond.” Lambert’s coolly commanding stage presence shined over the modernized road-dog anthem’s sauntering groove. Coupled with her ear for a hook, Lambert’s real-world relatability is a huge part of her appeal. The connection with her crowd was ever apparent during songs like “Heart Like Mine,” which reconciles faith with her modern lifestyle, or the smoothly confident version of “Bathroom Sink” – an ode to kicking self-doubt and emotional baggage to the curb. As Lambert’s unwavering voice soared above tip-toeing guitars, lonesome-heart ballad “Over You” got a cathartic boost when the crowd picked up the chorus. Despite the mildly hokey “Wizard of Oz” reference, the intimate soul-bearer was the vocal highlight of the night. It was somewhat disappointing (though not to the majority) that aside from “Tin Man” and “Vice,” Lambert skipped over some of the new record’s other stripped-down, lay-it-on-the-table highlights in favor of the bubblier “We Should be Friends” and “Pink Sunglasses.” Still, it’s understandable. It’s Thursday night, after all, and Lambert’s long past wallowing. During a tight encore of sterile fan favorite “Little Red Wagon,” during which her “backyard swagger” was unquestionable, Lambert updated a line in the sassy party-starter to reflect her current living situation. “I got the hell out of Oklahoma!” she hollered, alluding to her departure from the state where she and Shelton lived. Indeed, Lambert is doing just fine, making some of the best music of her career.